Overview: Separating techniques(chromatography, distillation, filtration and crystallisation) provide an excellent opportunity for students to apply their learning from the particle model, elements compounds and mixtures, state changes and conservation of mass. The practical nature of this topic also allows students to experience important ideas for themselves e.g. seeing a liquid form from an apparently ’empty’ tube in distillation. That said, there is a real need to ensure a careful balance is struck between the procedural demands of the practical and the conceptual demands of the science. If students are asked to think about both the science and how to do the practical work at the same time there is a risk that they will do neither well. Wherever possible, use the particle model to help explain how these methods work – zooming here is an important skill. 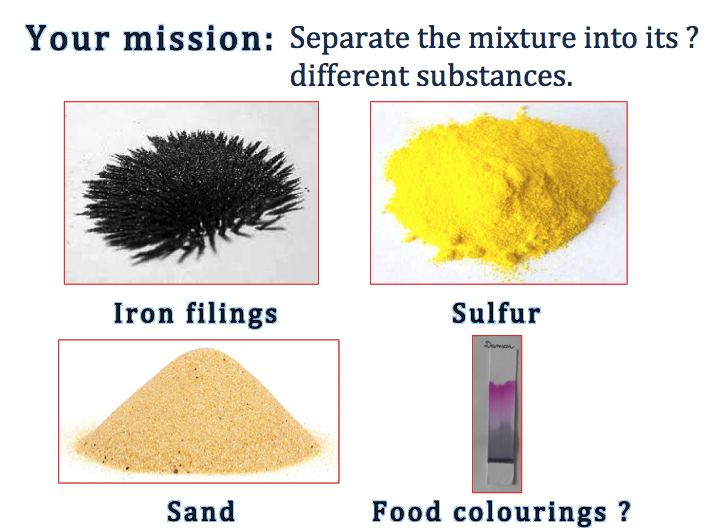 Key concept: a mixture can be separated according to the different physical properties of the substances that it contains. Misconception/error [scientific idea]: a mixture is one substance [a mixture is made up from various substances that are not chemically bonded]; society uses the word pure in the same way as a scientist [pure for a scientist means made from only one substance]. The resources below should only be used after all the separation techniques have been taught. 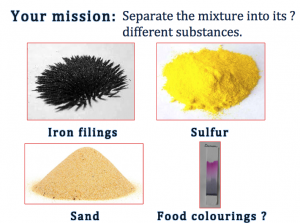 Students are given a range of practical equipment and work in pairs to separate a complex mixture containing sand, sulfur, two food dyes and iron. This activity was made in collaboration with Claire Couves and Rownok Jahan. Please conduct your own risk assessment before carrying out this practical. Key Stage 3 practical challenge to separate a mixture. Green, J.B. (2018). How to teach separation techniques. Education in Chemistry Blog.